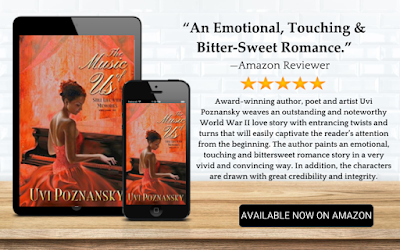 Award-winning author, poet and artist Uvi Poznansky weaves an outstanding and noteworthy World War II love story with entrancing twists and turns that will easily captivate the reader’s attention from the beginning. The author paints an emotional, touching and bittersweet romance story in a very vivid and convincing way. In addition, the characters are drawn with great credibility and integrity. The story had every element a good story should have. An exciting plot, attention to detail, but best of all fleshed out, well-written and well-rounded character development. There’s an abundance of well-illustrated scenes that make you feel like you are right there in the story, and that’s something I really look for in a good book. It’s a captivating and commendable read that had me engrossed from the beginning. The story flowed from scene to scene with ease, and the author shows extraordinary skill when it comes to storytelling. There are plenty of attention-grabbing moments in this page turner that will take the reader on a truly mesmerizing journey! I’m a big fan of Uvi so any ink that flows from her pen comes highly recommended from me. This work, The Music of Us, is of course, no exception. It’s one of those books that come along occasionally that makes you want to read it non-stop until you get to the end. I’m giving nothing further away here. And this, I hope, will only add to the mystery and enjoyment for the reader. A well-deserved 5 stars and a highly recommended read. A Mixed Metaphor Walks into a Bar….